Crystal's Crafty Creations: Quixotic Paperie 2nd Anniversary Celebration!!!! Quixotic Paperie 2nd Anniversary Celebration!!!! some of the SCACD Design Team have the pleasure of joining Quixotic Paperie today to help celebrate their 2nd Anniversary, and also to throw the spotlight on SCACD Stamps, which are available in the UK at Quixotic Paperie! Today designers from both the SCACD Stamps and Quixotic Paperie teams are showing off creations featuring some of the gorgeous images available through SCACD Stamps. It's not a hop, so feel free to dip in and out of the list of blogs however you please! 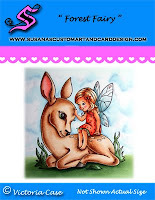 As you may be aware, SCACD Stamps is run by the lovely Susana of Susana's Custom Art & Card Design in the US. 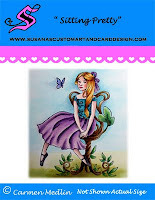 The SCACD Stamps range is available in the UK exclusively at Quixotic Paperie. There are three fantastic artists in the current range from SCACD Stamps - Carmen Medlin, Elisabeth Bell and Victoria Case, each with a different style. As part of the celebrations and the spotlight today, there is a PRIZE GIVEAWAY! Visit the Quixotic Inspirations blog for details and to enter! Today I would like to share a creation with you that I made with this FABULOUS Victoria Case Image for SCACD Hot Stuff!!! She is just PERFECT for those summer creations :)))) Hope you enjoy my creation today!!! For this card today, I used this fabulous NEW Bo Bunny Paper Barefoot & Bliss Collection....These colors just scream summer don't they??? I also picked up these fun umbrellas a couple weeks back and thought it would be fun to add one to my card!!! Also I wanted to let you know that SCACD is NOW SELLING Make it Crafty Stamps!!! WOOHOO this is very exciting, if you have a moment come check out these FABULOUS images!!!! I can't wait to play with them myself!!! Thanks soooo much for joining us, we hope you enjoyed checking out SCACD Stamps with us today!!!!! Wow Crystal gorgeous card - I love this image and your colour combo is great. Gorgeous, Crystal! I love that gal and those DPs are luscious!!! Beautiful Crystal~~ I just love the sunshiny colors and your coloring!! Gorgeous design gf!! She is so much fun! So sassy! Darling card, Crystal, and the DP's and colors are delightfully bright and cheery! Hope you are well...hugs!!! This is gorgeous, Crystal! I love how you did her hair. Great sentiment! Love the color choices on your beauty. Crystal, what a FABULOUS card! I love the umbrella!!! Beautiful colors. I love the umbrella! super cute summer card Crystal! Hi Crystal! I hope you are well my friend! This card is utterly gorgeous-love the fun bright colours and she is a darling! What a cool little chick Crystal! Love the papers you used! Fab card love the colours & the brollie looks fab! Thank you, for joining us at Craft Your Passion, good luck! Love the colors and the paper! OM Gosh she is sooo cute Crystal!! I absolutely love the blue & orange colors!! The umbrella is a perfect embellishment! What a lovely fun, bright and gorgeous card crystal. The umbrella is a great touch. Ohhh...love the umbrella!! What an amazing, fabulous card!! Oooh....check out that sultry little thing! Cute!!! Love the little paper umbrella you added...too sweet! Oh how adorable Crystal!!! Cute image and I'm loving the new dp! The little umbrella is the perfect touch!!! So glad you are back to creating and feeling better!!! This is so adorable, Crystal! I just love that umbrella and those fun papers! Awesome coloring too, girl! 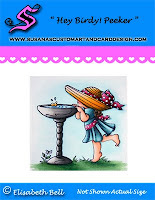 Hi Crystal, Your card is fab and the image is super sweet!! Whoa, girl...your coloring is spectacular on that adorable image and how fun to add the umbrella...this is the perfect summer card!!!! How very cute Crystal. That paper umbrella is a perfect embellishments. Awesome creativity!!! what a fun, summery card, that umbrells is "da bomb". thanks for playing with us at Paper Pretties. Aww..this is such a darling card! What a beautiful card, so summery. The image is gorgeous. Man do I wish I had her body.. This is so cute. I am so glad you are back to stamping and feeling better.. Sending hugs. Beautiful cards...such cute images...thanks for joining us at Bearly Mine ……..
Adorable! Super colors and papers. Love the umbrella too!! Oh Crystal this is so very fabulous! totally LOVIN that card!!!! love that flower hibiscus flower paper too!!!! thanks soo much for playing along with the Dollies!!! SUch a GREAT summery card Crystal!! LOVE that umbrella you added--perfect!